This blog has retired — read this for more | English, ESL -- and more! ← Catch-up part one: some interesting sites. thats certainly a shame, I just found your blog but it seemed to have lots of useful info. I have been teaching public speaking within the ESL community for almost two decades. Not only are public speaking skills crucial for for the ESL communtiy for the obvious practice of speaking, but also, by standing up and speaking, and doing it correctly, an ESL speaker becomes more confident because he/she is not only working on their clarity of speech, but the individual is also confronting the number one fear in life (public speaking). By working on public speaking skills, ESL speakers are empowered on infinite levels. I have just started a course as home volunteer tutor. Just browsing on the inernet, I found this site. I wish he would be back soon. It’s a shame to see this blog retire. Good luck in your future endeavors! I posted a comment/request on your blog “More Tales from my Mother 1- Spencer NSW” regarding permission to use the photograph of Spencer for our local paper. I would be most grateful for your permission. regards, Marguerite Svendsen, Publicity Officer, Spencer Community progress Association. It’s certainly a pity that you’ve hung up your ESL writing hat, but I know blogs can be very demanding. However it still remains a great resource.Good Luck. Too bad. I just found this site. Wish I had found it earlier. Ah, well. I am a few years too late it seems. 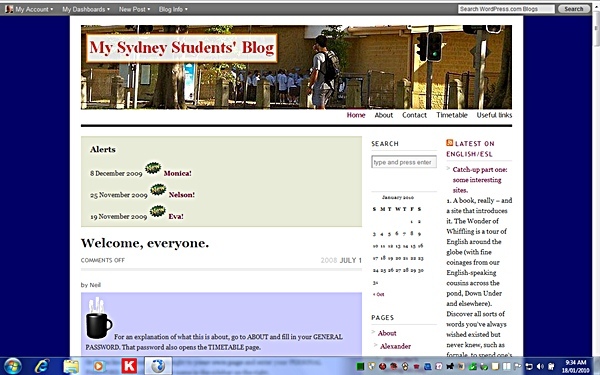 Just for the record…did you know that your blog is still listed as one of the top ten ESL EFL Teacher Blogs on About (dot) com. Enjoy retirement! That is a real shame! Still listed as a great blog!